What's in Patti Smith's bag? 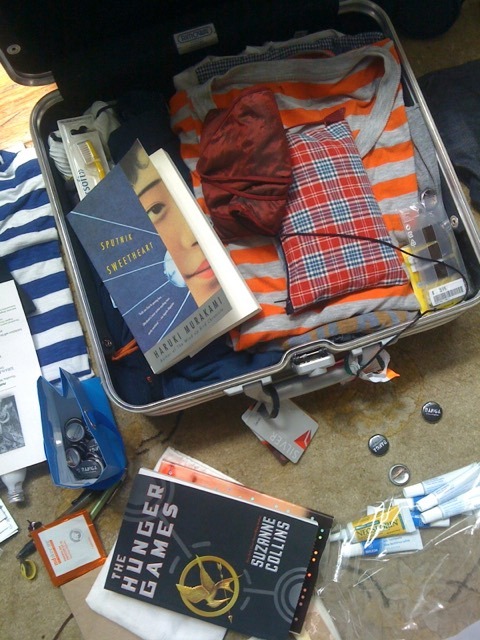 Legendary poet and high priestess of punk Patti Smith posted photos and details of what she packed for a recent tour. Smith is on tour right now, playing her iconic album Horses in its entirety (and then some), and I hope to catch one of her always-incendiary and inspiring performances. I always travel light. Besides my dungarees and my trusty Ann Demeulemeester black jackets, everything can be washed in a sink in a hotel room and laid out on a windowsill to dry. For instance 7 tee shirts (including 4 electric lady teeshirts) and 7 pairs of bee socks. The worse part, besides saying goodbye to my daughter Jesse, is picking out what books to take. I decide this will be essentially a Haruki Murakami tour. So I will take several of his books including the three volume IQ84 to reread. He is a good writer to reread as he sets your mind to daydreaming while you are reading him. thus i always miss stuff. I inventory Moleskin notebooks. seven small tubes of Weleda salt toothpaste. witch hazel wipes. Loquat leaf tea bags for cough. essentials like that. I guess I am ready.